Since it appears that Ol’ Man Winter isn’t going to let go any time soon, we’ve decided to just accept the fact that it’s winter and move on. 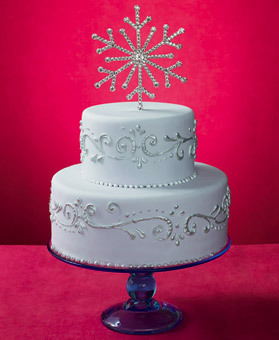 And today we’re moving on to this lovely wintery wedding cake. It’s so pretty that you almost want to love snow again. Almost. The small wedding cake it lovely on its own with the simple white fondant icing. But when they add the silver filigree piped on to create the scroll work, it takes it to a whole new level of gorgeous. This cake would be absolutely perfect at any winter-themed wedding. And when the Swarovski crystal snowflake topper is added it becomes a perfect winter wedding cake. I just love the cool color combination of bright white and sparkly silver. It’s understated but beautiful. You can’t go wrong with this cake design! We discovered this lovely cake here.